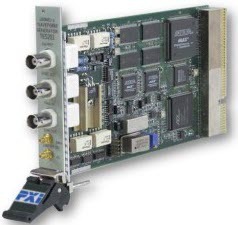 PXI Arbitrary Function Generator Card - GX1200 | Marvin Test Solutions, Inc. The GX1200 and GX1201 are high performance, single-channel PXI arbitrary waveform generators that combine a function generator, arbitrary waveform synthesizer, programmable sequencer, pulse generator, and modulation generator in one instrument. The GX1200 Series delivers all this at a lower cost than comparable benchtop or VXI-based instruments. The board is supplied with a 32-bit DLL driver. Various interface files provide access to the DLL from programming tools and languages such as ATEasy, LabVIEW, C/C++, Microsoft Visual Basic®, Delphi, and more. The available virtual panel can be used to interactively adjust and control the instrument from a window that displays the instrument's current settings and status. Permits division of the memory bank into smaller segements. Segments may be linked and repeated in user-selectable fashion to generate extremely long waveforms. Stepped Sequence Advance Current segment is sampled continuously, external trigger advances to next programmed segment. Control input is TRIG IN connector. Single Sequence Advance Current segment is sampled to the end of the segment including repeats and idles there. Next trigger advances to next segment. Control input is TRIG IN connector. Provides dual functionality. Sync, which is sychronous with the output waveform, and Marker in FM and sweep modes. An output that is directly derived from the sample clock generator and has an output frequency equal to the programmed sample clock frequency, including modulated waveform such as FM, sweep, and FSK. Gated Mode External signal enables generator. First output cycle synchronous with the activeslope of the triggering signal. Last cycle of output waveform always completed. Multiple instruments can be connected together and synchronized to provide multichannel synchronization. Compatibility Conforms to IEEE488.2 and is compatible with SCPI (Standard Commands for Programmable Instruments).